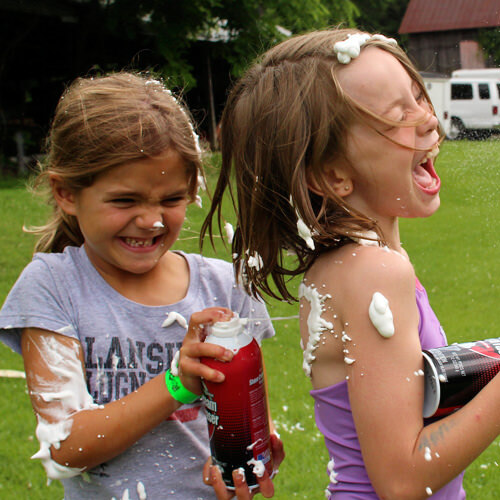 This is our full camp video (14:04 minutes) introducing you to what makes Rockbrook special. Because of Rockbrook, I feel I’ve really grown as a person. Because of Rockbrook, I look forward more to summer than any other time of the year. Because of Rockbrook, I’ve become more sure of myself and a much stronger leader. Because of Rockbrook, I’ve learned to get out of that shell that I used to have. Because of Rockbrook, my life has turned upside down in the greatest way possible. 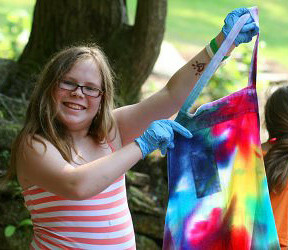 A Rockbrook girl isn’t afraid to get a little dirty. She’s very well-rounded. I love the people here at Rockbrook, they’re so energetic and just so fun-loving, and they’re just so welcoming. I mean, even in my first year I felt like I’ve been here for four years. 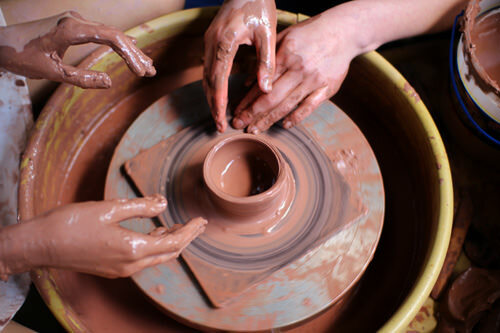 I really love the way that all the kids here are so friendly and also you get to try so many activities that you would never ordinarily get to try. Everyone is encouraged to be imaginative in every aspect of the day, so if you want to make up a new friendship bracelet pattern then you can. If you want to make up a song. The energy here just is lifted, like coming into a different world almost. Rockbrook is about having fun. 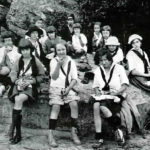 Rockbrook is about being yourself, being a girl and growing. Rockbrook is about giving girls a space where they belong. Since 1921, Rockbrook has been a haven in the wilderness for girls everywhere. 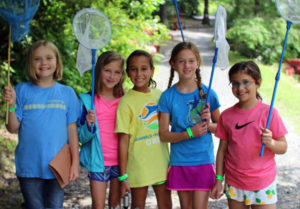 Rockbrook gets girls outside. It’s a place of encouragement and growth. But most importantly, it’s a place where girls relax and be themselves and make true friendships. When you come to camp you are constantly surrounded by trees and your best friends and all these amazing counselors. The atmosphere here at Rockbrook is definitely like no judgment. It’s not like home where you have to worry about what other people are thinking about you. Here is my time where I can just let go and be who I want to be. It doesn’t matter who you are or where you’re from or your background my pen pal from my first year is my best friend this day. It’s just super cool to have that friendship that I’ve had for nine years. Now there is people from all over the world, like someone in my cabin is from Italy. One of our counselors is also from Mexico, so it’s really cool. Like, you don’t know anyone and then in one day I knew everyone. 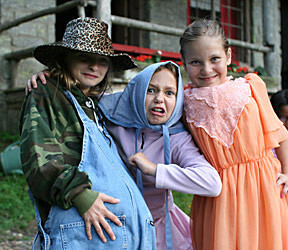 So that is why I think that camp friends are like sisters. At home I’m also not going to run around in a tutu with paint on my face. You just feel like you’re in a safe atmosphere to be who you are and it just makes everything feel better. I just walk around this camp and notice how goofy everyone is and how easy it is to just be present here. It’s just you being you whenever you want. 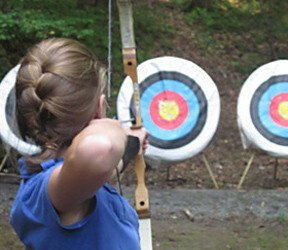 The campers sign up for new activities every three days and over the course of their session they can sample nearly all the activities that are offered here at camp. 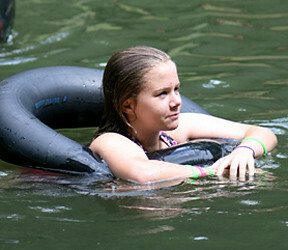 This allows them to sign up with their friends but also to reinvent their camp experience each week. I really like riflery and arts and crafts. It’s not about a grade, it’s about everyone having fun and what does that fun mean to you? I really like gymnastics and swimming. There is so many small moments at camp that we don’t even realize happen, but you learn from it each time it happens. I just climbed the top of Castle Rock it was awesome. I just did a wet exit! 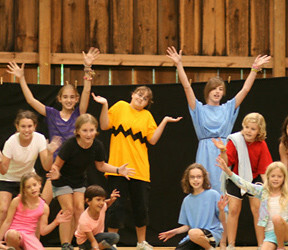 One of my favorite activities is play, because I am in the play this year and it’s really fun. You just have to encourage the young girls to take a little bit of a risk. It’s just you getting use to something and learning to okay if I did that this time picking yourself back up. 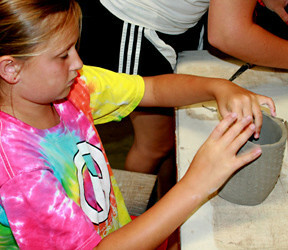 Rockbrook camp is very much about building confidence in young girls. 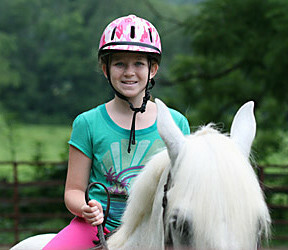 It’s a great confidence builder for a young girl to be able to know that they can control a 1200 pound animal. It gives me a chance to become better at riding because I try different horses and I’m trying new things on different horses. They also talk to you about what you want to do. We’re very apt as far as with our skill development to really focus on what they want to work on and create goals for them in the beginning of the session and really try to understand what they want to do while they’re at camp. We’re going to find that horse, we’re going to find that special horse that you can bond with that you feel safe and comfortable on that you can have a blast with. We offer different levels of every rider from beginners to advanced to girls who just want to ride for fun to girls who really, really want to develop their skills and thinking about being a competitive rider. 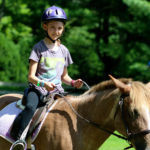 It’s also a great place to create relationships, creating a relationship whether it is with our two legged instructors or our four legged instructors it’s a really great place for the girls to really come and feel loved and to build those character skills that are really important as a young girl. I think it’s personally amazing. If we want to hike to a waterfall and just spend the whole day playing in creeks that’s what we do on our backpacking trips. If we want to go to the top of a mountain and then come down and set up our camp and explore some more that’s what we do. 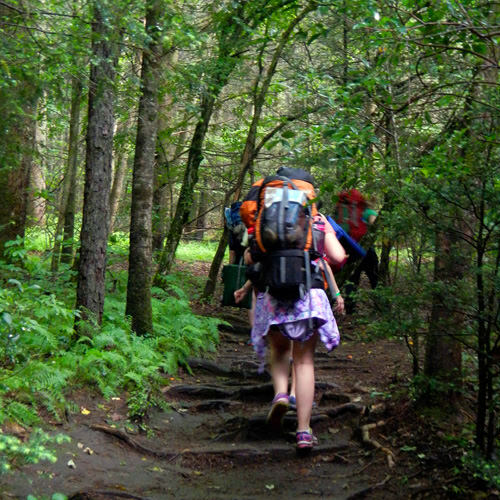 If we just want to hike into the forest and set up camp and sit there and enjoy it then we’ll do that. 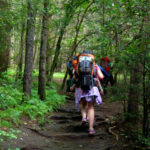 Being in a natural environment I think helps kids to realize the importance of friendships and gain those really life long relationships that they would not otherwise have. If you sign up for climbing as an activity we have the Alpine Tower which is like a log system that you climb up. 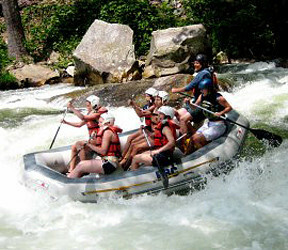 We also do special trips up to Castle Rock which is a rock on camp here. 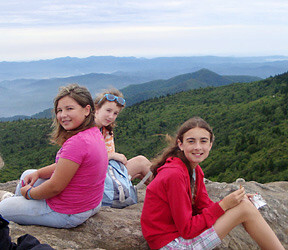 Those girls who want to progress even further we offer climbs into Pisgah National Forest. Climbing challenges you at many levels. First of all the physical realm, you wouldn’t think it but it also challenges you mentally as well so each climb is a puzzle and each person according to their physical makeup has to determine how they are going to climb that climb. And so it really gets to be a mental activity as much it is physical. 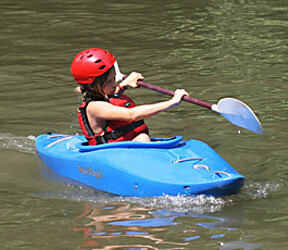 We really focus on having the kids who have the skills teach the others and encourage the others and through that build friendships while they are on the river and build partnerships for getting through the challenges that we face out there. I never done whitewater kayaking before I came to camp and now we’re some of the best kayakers at camp.I’m very proud of myself getting this far and being so comfortable in the class three rapids and even some of the class four rapids. We have activities. Free time, which is normal… time to chill and then those special Rockbrook surprises. Surprises are really… There’s a surprise everyday at Rockbrook. Surprises are really a big part of our program. We keep so many things a surprise because that is part of the magic of camp. It could be a regular schedule in the morning and then in the afternoon we have a carnival. We love the little bits of spontaneity that we can bring into our days and over the course of the session you see girls put on a crazy costume or show off their headstand, just do crazy things that they would never even consider doing out in the real world. 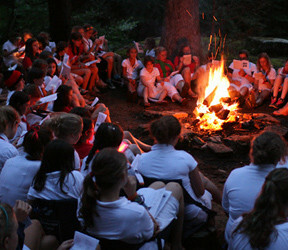 The last night of camp is the Spirit Fire, which is a long standing tradition at Rockbrook. The girls reflect on all that they accomplish and all that they’ve experienced during their session here. 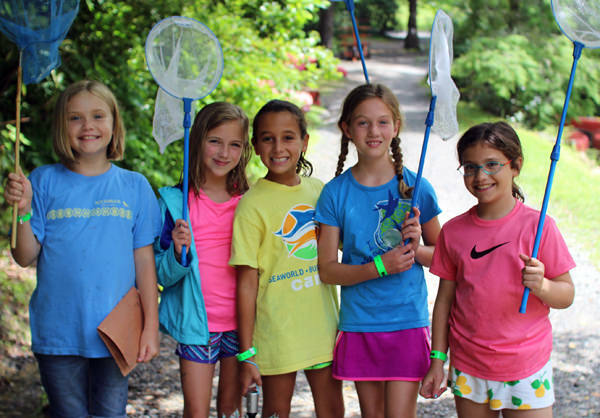 Through their time at Rockbrook we hope that our campers have gained a greater sense of self and feel more connected with the natural world and each other. No other camp is like this one, I’ve never felt so in touch with people. I feel like Rockbrook is family now. A Rockbrook girl is someone who you can count on for everything and she’s the one that’s always going to be there to just listen. These people are my best friends, I’ve never had any other friends as genuine and as there for me, counselors and camper friends alike. It’s almost indefinable, it’s something you just feel, it’s the sound of the running water, the sound of girls voices as they are shrieking with glee because they get to dress up that night as some crazy character for some event. I do think there is a uniqueness to the community at Rockbrook, people are always laughing or saying hello or trying to build each other up. And so it all about being the best person you can be. Life at Rockbrook is almost like a dream. You have this beautiful setting. You have these amazing people with their own personality, not a personality that they fake when they’re at school and at home. It’s their true personality. A Rockbrook girl is someone you can count on for everything and she’s the one that’s going to always be there and to just listen. It’s almost indefinable. It’s something you just feel. It’s the sound of the running water, the sound of girls’ voices. As they’re shrieking with glee because they get to dress up that night as some crazy character for some event. I do think there’s a uniqueness to the community at Rockbrook. People are always laughing or saying hello or trying to build each other up. So it’s all about just being the best person that you be. It’s definitely going to make a better person. Rockbrook does a great job of empowering the kids, it makes them comfortable in their own skin. Everyone is important here. Through Rockbrook she had this whole book of experiences that I had not witnessed but that were part of what she draws on for her strengths and her understandings of who she is in the world. From top to bottom I think that the counselors are incredibly enthusiastic and represent exactly the kind of role models that we like to see our girls have. The staff here is amazing, they paid so much attention to Maddy, they made her feel safe, you know they made sure that she made lots of friends. The staff has been great. The feeling that you get from them when they are ready for your camper, they know who you are, they are really on it they are on every detail. There is such a great feeling of warmth and enthusiasm. The staff here, they’re more like a second family or a second Mom. They’re older then me yes, but they are my best friends. 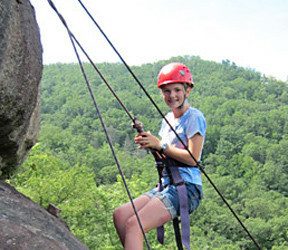 Explain to a six year old that it’s going to be the most fun that she’s ever had in a safe environment, and from there she is going to have the best summer of her life.